Tonga emi wanpela kantri long Osenia. ↑ New Zealand Ministry for Culture and Heritage (19 July 2010). Towards independence - NZ in Samoa. nzhistory.net.nz. Retrieved on 29 April 2011. ↑ 3.0 3.1 3.2 3.3 Samoa. International Monetary Fund. Retrieved on 2010-04-21. 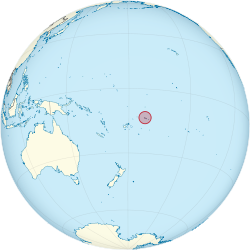 Sampela piksa long Samoa istap long Wikimedia Commons.